I have too many saddle pads, as evidenced by the fact that these three sets haven't even been taken out of their packaging. My best friend is threatening to disown me and any day the husband will accidentally open the door to what he thinks is our second laundry to realize it's actually a tack closet. Plus, I have duplicates of two of these colors and the third one, fuchsia, is not to my taste on the redhead I currently ride. $65 for pad and polos + shipping, or take all three sets and it's $180 with shipping included. 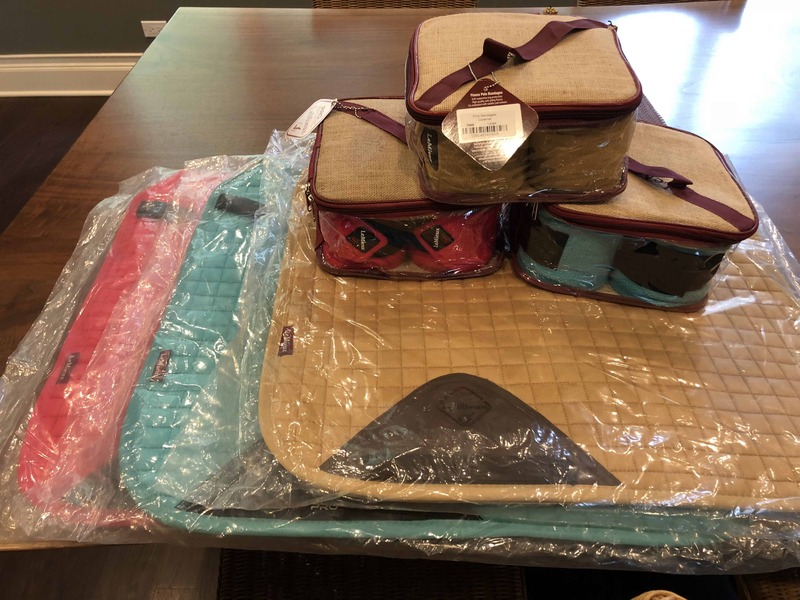 All three pads are LeMieux pro sport lustre dressage square in large (for saddles 17" and up, horses 15hh and up) and all have matching large polos. Really nice quality polos, the saddle pads have velvety finish on top and bamboo lining. Short girth straps. Are you going to Equine Affair Nov 8 or 9? Might be interested in the fuchia. For some reason I think you are or maybe were in New England. Snork I would like the caramel set. I'll PM you. I’ll take the turquoise! I’ll pm. Oh dear Lord you are way worse than me. And I'm bad. I'm so glad these sold quickly.